Langbeinite 0-0-22 is a naturally mined crystalline mineral that supplies the water-soluble sulfate form of potassium, magnesium and sulfurs. 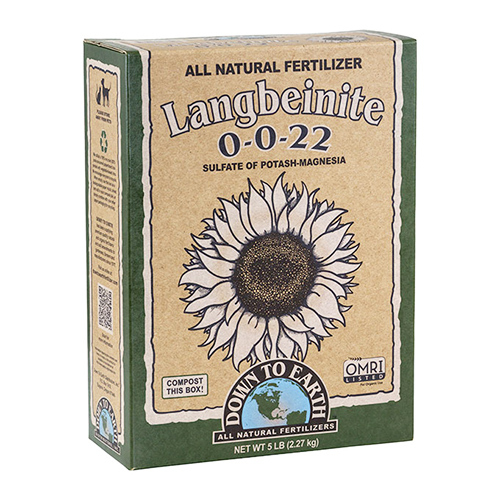 Down To Earth™ Langbeinite 0-0-22 is a naturally mined crystalline mineral that supplies the water-soluble sulfate form of three vital plant nutrients: potassium, magnesium and sulfurs. It’s maximum chlorine content is less than 3.0 percent, minimizing the potential for fertilizer “burn,” and it’s neutral pH does not alter soil activity. Potassium contributes strongly to overall plant health by regulating internal processes. Since potassium makes up part of the fluid of the plant, it is found throughout plant tissue, meaning plants need a strong source of potassium as they grow. Potassium deficiencies lead to weak stalks and immature roots, leaving the plant susceptible to insets. DTE™ Langbeinite 0-0-22 is widely used on sensitive vegetables and fruit crops that require high fertilization rates but do not tolerate high levels of chlorine or soluble salts. This standard grade langbeinite has a typical SGN of 95 and is an excellent source of readily available sulfur, potassium and magnesium. Apply 1-2 lbs per 10 square feet and thorough;y mix into soil. For new plantings, mix 1-2 tablespoons per cubic foot of soil OR 1-2 lbs per cubic yard. For established plants, apply 1-2 teaspoons per gallon of soil.